Of course, different people prefer different breads. I like variety, but I am here to say that I love challah. Being a newcomer to baking, I’ve only tried eight or ten different breads. And probably half my bakes have been some variation on Sourdough Pain de Campagne (Hamelman and dmsnyder, for instance). I’ve managed to learn “on the job” pretty quickly, thanks to lots of reading, TFL tips and occasional chats with David. I was fortunate enough to find myself this weekend in Dr. Snyder’s bread lab. With all the ingredients for challah, and with a lot of turkey to be sandwiched for a lot of Snyders. What were we to do? David gave excellent instruction. I know my kneading, strand-rolling and braiding technique were enhanced by the guidance of an experienced challah-er. And the results were more than merely edible (http://www.thefreshloaf.com/node/20820/thanksgiving-2010-baking). There’s something really fun about team baking. I used the same formula as a few days earlier—Maggie Glezer’s “My Challah” from A Blessing of Bread. It is a yeasted dough and the whole things takes about 7 hours. It’s easy if you know how to do it. Here's today's homework. 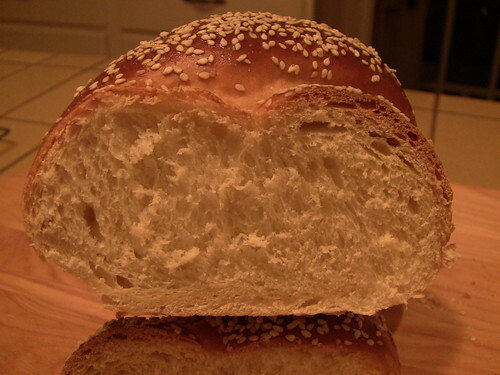 I am happy with everything about this bread: appearance, melt-in-the-mouth texture and –especially- the flavor. Just sweet enough, just eggy enough. I know that sourdough challah is supposed to have a longer shelf life, but with bread that tastes this good, I’m not worried about it getting stale before it disappears. During the course of a quick dinner of Turkey sandwiches, between “yummms”, my chief bread-tester informed me: “this would make great cinnamon toast.” “this would be great for grilled cheese sandwiches,” and “this would be great for French toast”. I think we have a winner. Thanks for the recipe, Ms. Glezer. And thanks for the seminar, David. Lovely crumb and braiding! I love it too! It was my favorite choice for Thanksgiving company..I made 2 round challah's. Like you said it's great for sandwiches, toast and everything an easy to make the dough with lots of flavor. The 3 rope braid that starts in the middle, braid down, flip over, braid down... is another easy attractive braid I like to make. What a great bread anyway to serve it. I enjoyed the tag team baking, too. You're a quick study. Since Susan, who is not as great a fan of challah as you, Cat or I, liked this one a lot, I'll be making it again soon myself. Bread is too good if it makes me want to stay home from work and make it again. Caroline, Here's the timetable. I guess it was more like 6 hours. 30 minutes for gathering and preparing ingredients and for the flour-yeast-water slurry to bubble. 20 minutes to mix and knead. Almost 3 hours for first rise in cool kitchen. 20 minutes to form loaves. Two hours for second rise. 10 minutes to egg wash and apply seeds. 45 minutes to bake. 45 minutes to cool. Congratulations on graduating from Challah U. Glen; you had a talented professor. But it's continuing education. I keep learning new recipes (thank you, Maggie G.) and ways to shape the dough. For Thanksgiving I fashioned a challah recipe with substitution of 1/3 bread flour with w/w/ pastry flour and a little more honey than usual and some "healthy" margarine replacing some of the oil (kind of like "my challah" in ABOB but larger amount--4 1/2 cups of flour in total). Then I divided it and half made a small pan challah for Fri. night and the other half, for Thanksgiving dinner, I shaped into 12 rolls (3-oz. size, I believe) which I then placed in a 9-inch round cake pan. I shellacked as usual (egg wash) and sprinkled on sesame seeds. It made great pull-apart rolls. Braided breads are as lovely to look at as I'm sure your challah is to eat. Welcome to the wonderful world of braiding! I'm just going to have to try making Challah...your loaves are beautiful! I've read so much here about how versatile a loaf it is that I picked one up to see what it tasted like. The other night we realized we were running short on bread to make dressing so I donated the Challah to the cause. When I went off to work my husband was planning to mix it in with the Italian bread I had baked. His experiment turned out to be the best dressing ever! 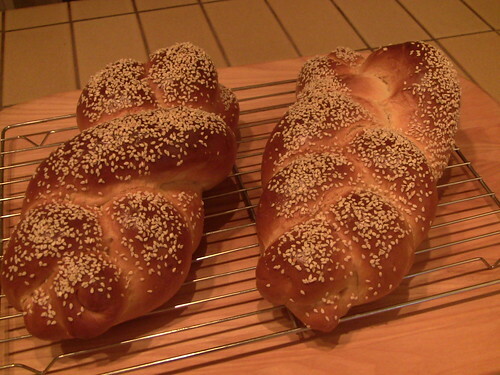 So, since I didn't get to try the Challa by itself...guess I'll just have to bake some! Toni, Mama Snyder used to put Challah in her dressing. You do have to try it "straight". It's a great invention. I like this Challah so much. So I try to making my first braiding pumpkin bread. I think they're also Challah.